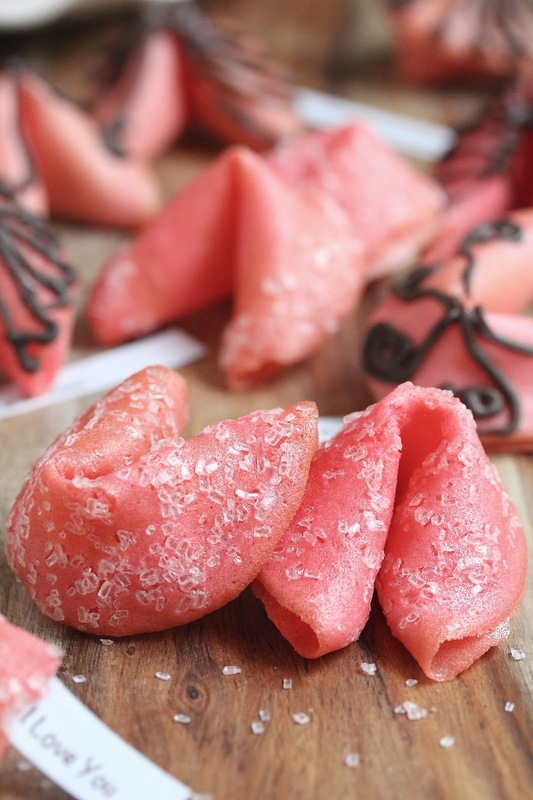 Make strawberry flavored fortune cookies for your special someone(s) on Valentine's Day. Personalize the message and customize the decoration. 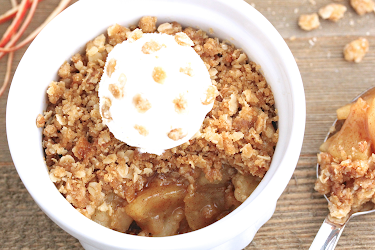 Add sparkling sugar, melted chocolate, or whatever you choose! They are so much fun! Valentine's Day is three weeks away but I'm excited to share these cuties early with you! Why am I excited? Mainly because I'm not a huge fan of the commercial fortune cookies. I find them too firm as a cookie and they taste meh. But these are deliciously strawberry flavored and are crunchy without being too hard. They are something I am thrilled about! I'm new at making fortune cookies. Because I didn't care for them, there was little desire to whip up a batch. After experimenting and adding my own twist, they will be added to my cookie repertoire. Need I even say they are so good!!? If you're looking at these and think you need to try them, you've got to!! 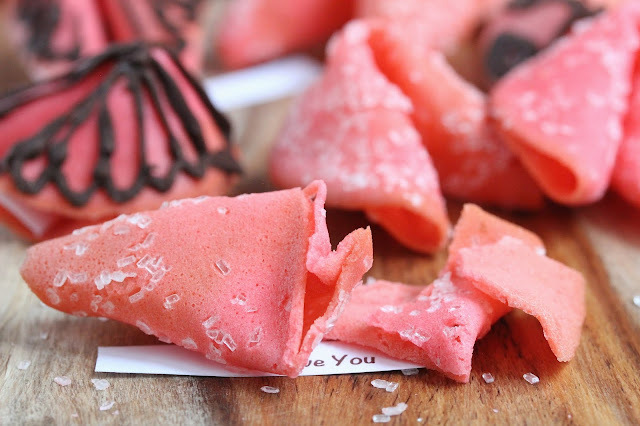 Making fortune cookies is fun but with one caveat (keeping it real)—there is a slight learning curve. The cookies are shaped while hot and you need to work quickly before they cool. Expect to fumble on the first few if you are a newbie. 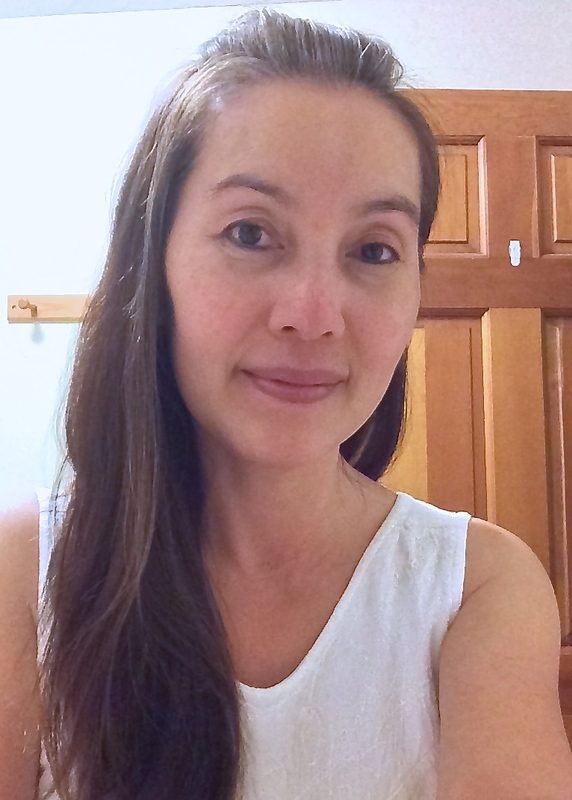 No worries though—as I discovered, with a little trial and error, it becomes easy. As mentioned earlier, working quickly once the cookies come out of the oven is key. All it takes is a little practice. They cool off and firm up quickly, at which point they can not be shaped. The cookies could be reheated for a minute in the oven to soften, but I think it's best to work without having to reheat. I fear that they might become overdone. For that reason, start with baking only two cookies at a time. As you get better and more confident, increase the amount. 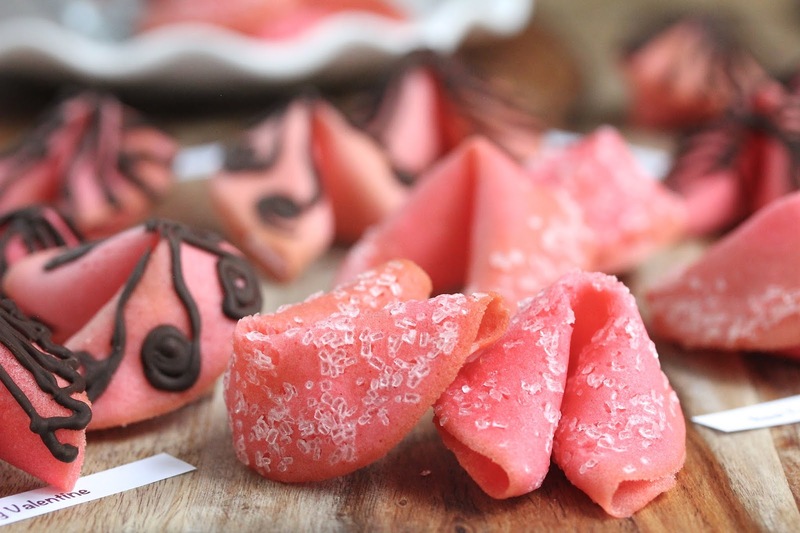 These fortune cookies are tasty and beautiful served plain, but decorate them for extra fun and pizzazz. For the sparkling sugar cookies, I sprinkled the sugar directly onto the batter on the cookie sheet just before they go into the oven. For the chocolate adorned cookies, I piped melted chocolate onto the cookies after they were shaped and cooled. Dipping the cookies in chocolate and coating of nuts or sprinkles would be awesome too! I'm sure you can get very creative. Whatever you do, don't try adding mini chocolate chips to the directly to the batter. You will be very disappointed (take it from someone who made that mistake)! The chocolate will smear all over your hands and make a huge mess during the shaping process as they are hot and gooey. 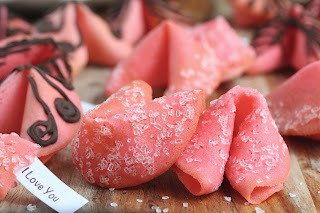 Not only are these cookies perfect for Valentine's Day, they are also great as party favors for bridal showers, gender reveal, and lets' not forget Chinese New Year! Just swap out the color, flavor and the message to suit the occasion. Seriously, give these a try!! 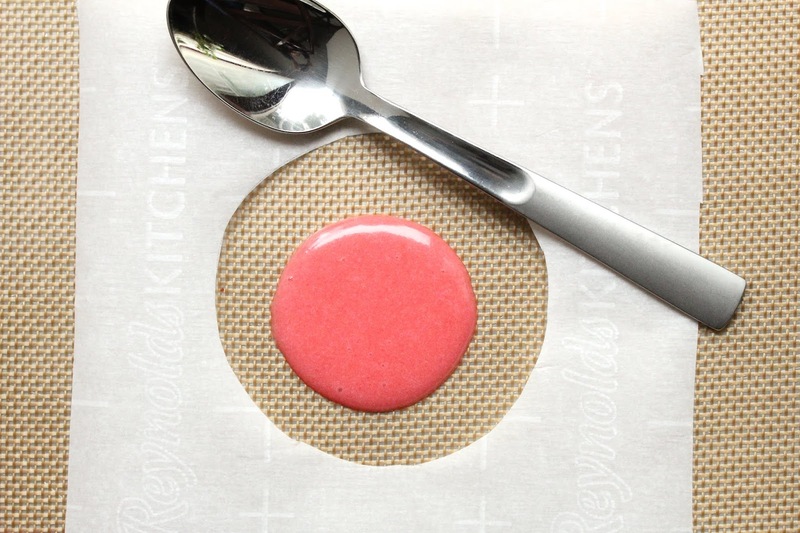 Preheat oven to 350 degrees F. Line a baking sheet with a silicon baking mat. 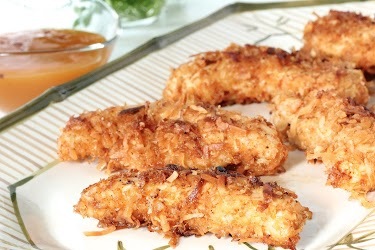 Alternatively, line with parchment paper or spray with cooking spray. In a small bowl, whisk egg white and sugar for 20 seconds. Add strawberry extract, food coloring, and oil. Whisk for another 20 seconds. Add flour and salt. Whisk gently until the flour is just incorporated. Add water. If desired, add more food coloring to obtain the color of your preference at this time. Whisk gently for a few seconds until the batter is smooth. It should syrupy in thickness and should fall in ribbon from a spoon. 3 1/2-inch (approximate) wide circle that is no more than 1/8-inch thick. Add more batter if necessary. If decorating with sugar sprinkles, sprinkle some on top of the two rounds of batter at this time. 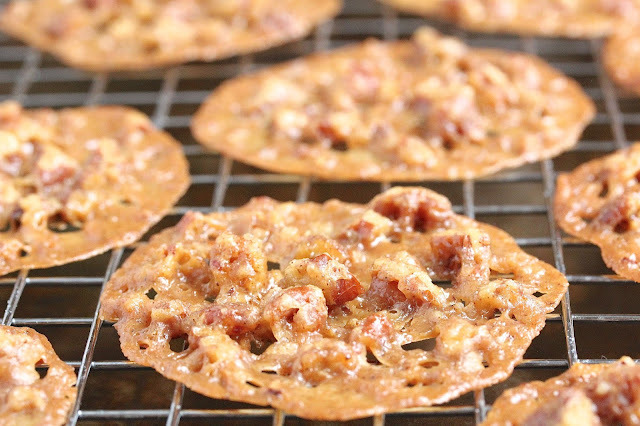 Bake cookies for 6 to 8 minutes or until the outer 1/4 to 1/3-inch rim becomes lightly golden. Remove from oven. Quickly transfer and flip one cookie, top side down, onto a work surface. Place a fortune in the middle. Bring the edges together to form a semi circle. Do not press at the fold. Cinch the edges together at the top. Place cookie over the rim of a cup, cinched side up, with the center of the fold sitting on top of the rim. Pull the two corners down to hug the sides of the cup. Hold for a few seconds. Transfer to a muffin tin to help the cookie hold its shape. Continue with the second cookie. If decorating with chocolate, place melted chocolate in a piping bag with a small round tip or in a zip lock bag with a tip cut off. Pipe chocolate onto cooled cookies. Chill for a few minutes for chocolate to set. Store in an airtight container at room temperature for 3-4 days. Makes about 15 cookies. To form perfect circles with the batter, hollow out a 3 1/2-inch round hole on a piece of paper or cardboard to use as a template. Place the template around the dollop of batter on the baking sheet and spread batter to cover the hole. If the batter does not spread easily when forming circles on the baking sheet, adding a few drops of water to the batter remaining in the bowl will help subsequent batches spread more easily. Cookies that are over baked may crack easily while being molded. Reduce baking time slightly. Cookies that are under baked may fall apart while being molded. Increase baking time slightly. Start with baking only 2 cookies at a time and increase the amount as you feel more confident. If cookies harden before you get a chance to shape them, return to the oven for a minute to soften. These are SOOO pretty, Thao! What a brilliant idea. I want to make them for my kids asap! What a cute idea...I love it. How perfect for Valentine's day! I think I need some strawberry extract! You really do, Inger :) Happy early Valentine's Day! !